Variety is the key to an attractive garden and few types of plants are better for creating it than small trees. Large enough to be distinctive, but small enough you can plant several and achieve an interesting mix of species or varieties, they’re always a highly versatile addition. There’s a huge range to choose from as well, so it doesn’t matter what the soil and climate in your area are like or what your personal tastes are; you’ll find something that suits you perfectly. 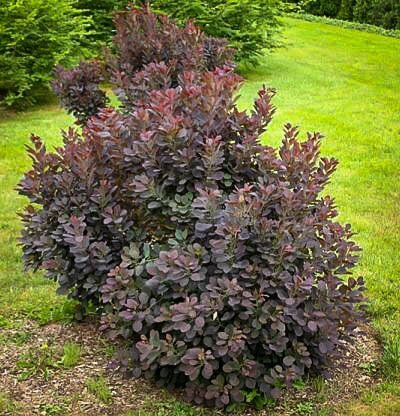 Some species have particularly high popularity, though, and one of these is the smoketree Cotinus coggygria. Easy to grow and the perfect size for most gardens, this tree is famous for the way its flowers fade and turn to puffs of pinkish strands, which give it a wonderful smoky appearance. The Velvet Cloak variety is an especially beautiful example of the smoketree and is guaranteed to add an extra touch of class to your garden. Small trees are always an attractive garden feature; whether they’re scattered around as centerpieces or planted together to create a natural-looking leafy glade. That’s especially true of the species that produce showy flowers, bright fruit or other distinctive features; while most trees are quite bare in winter they can be exceptionally beautiful through the warmer months and nothing helps with that more than a splash of color. That color can come from many parts of the plant – some trees are popular for having bright red foliage all summer – but among the most spectacular are Smoke Trees. 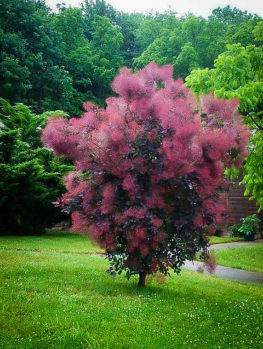 Two different Smoke Tree species are found throughout the northern hemisphere, including one native to the USA, but Cotinus coggygria has a natural range that sweeps from southern Europe all the way across to central China. It’s a tree that thrives in rough, infertile ground and it can often be seen in mountain areas. However, it’s now become popular among gardeners for its distinctive appearance, and can be found throughout the world’s temperate zones. It will also hybridize with the American species, but the beautiful Velvet Cloak variety is a pure Eurasian Smoke Tree. Velvet Cloak is a small tree that reaches a height of between 10 and 15 feet when cultivated. It has a spreading form and the width can also be up to 15 feet. This tree tends to have quite a loose structure which gives it an open, airy appearance – it can be grown even in a quite small garden without overwhelming its surroundings. From spring its branches are covered in mid-sized leaves up to three inches long; these have an ovate appearance and an attractive dark blue-green color, often with a hint of red, making it already a very handsome plant. Not long after the leaves appear the tree flowers, although this isn’t much of an event – the flowers, which are a pale yellowish color, are small and inconspicuous. They’re also very numerous, though, and clustered in spikes six to eight inches long at the ends of the branches. Each flower grows at the end of its own long, fine stalk, and later in the year these stalks will create the tree’s real display. As summer warms up and the dead flowers fall away the stalks turn a smoky pink that slowly darkens with shades of purple; the effect is to make the tree look as if it’s surrounded by a light haze of smoke, and it’s truly gorgeous. Later, in fall, the leaves turn autumnal; in the right conditions the Smoke Tree can put on a fine show of yellow, orange and reddish-purple foliage before the leaves finally succumb to winter. 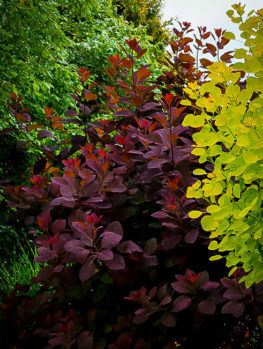 The Velvet Cloak Smoke Tree can be successfully grown in USDA plant hardiness zones 5 to 8, meaning it should do well anywhere apart from the coldest northern regions and the more arid parts of the South. If you’re in the large area where it grows and you’d like one, the first thing to do is find a spot that gets full sunlight – this is not a shade-loving tree and won’t look its best without adequate light. It prefers moist, medium soil that’s well drained, but it’s pretty tolerant and can settle in well in a rougher patch that other plants shun. A rocky, infertile patch is fine too. The one thing it won’t cope with is waterlogged soil. Maintenance of the Velvet Cloak is easy. It doesn’t require pruning unless you prefer to reshape it, but it’s tolerant of it and in fact can be pruned to help with its growth. If you’re looking for foliage, you can cut it back hard in early spring to encourage an explosion of new growth with larger than normal leaves. Alternatively, giving it a light trim will boost the production of flowers – and, later, its signature smoky effect. Apart from that it will more or less look after itself; there are no major disease or pest problems to worry about, although occasionally it can suffer from rust, leaf spot or verticillium wilt. An occasional check should identify any of these problems before they become incurable. Because of its size, hardiness and tolerance of pruning, the Velvet Cloak is an exceptionally versatile tree. Its appearance makes it ideal as a centerpiece, especially in a naturalized garden where its open spread and distinctive looks are perfectly suited. As an accent plant it will also attract a lot of attention thanks to the smoke effect, which usually lasts all summer and into early fall. It can also be used as a rustic-style hedge; plant a line of them and prune them hard, and you can shape them into a dense hedge that in full summer plumage will act as a very effective privacy screen for your property. 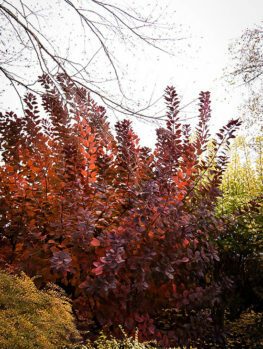 There are many trees you can use to enhance your garden, but the Smoke Tree gives you plenty of reasons to choose it and the Velvet Cloak is one of the best in our opinion. 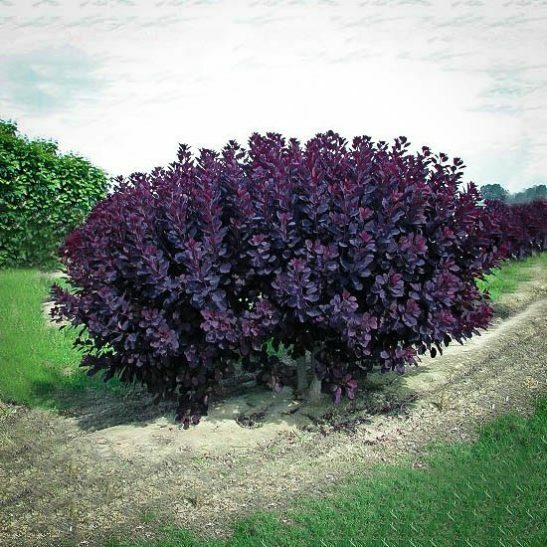 You may also want to consider some similar varieties of this popular plant, like the Royal Purple Smoke Tree or the Grace Purple Smoke Tree.